(For details visit our Shipping Calculator). Available Colors and Frequently Asked Questions appear below. Colors are not always represented accurately on your computer screen. Feel free to request color samples and we'll send out actual powder coated metal samples. Q. What are Can-Am cabinets made of? Q. Are all cabinets fully assembled? A. Yes. All cabinets come fully assembled. Optional items such as shelves or dividers and backstops are packaged separately. Q. How high can I stack cabinets? A. Drawer cabinets can be stacked a maximum of three high, not exceeding nine drawers. 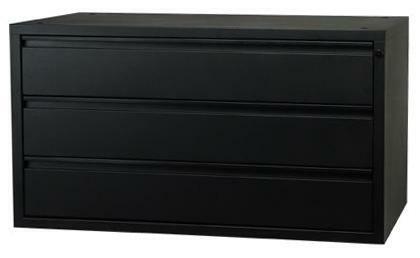 That stack can, however, be topped off with a non-drawer cabinet, such as a CABDR16 or FDCAB20. This also applies to cabinets on 5.1 or 7.6 cm legs. Screw-in wheels, 10.2, 12.7, and 15.2 cm legs should only be used with single cabinets. If you need a stack of cabinets on wheels, you should use a heavy-duty caddy. For clarification of what you should or should not do, please test your configuration on our Go Configure Page. Q. Are the dividers and backstops really necessary for CD / DVD / Blu-ray storage? A. The dividers and backstops work together to keep your CDs, DVDs, or other media in rows and under control when you don't have a completely full row. And, it is unlikely that your media drawers will be completely full at all times. Most people who don't order them with their cabinets end up getting them later, at an additional shipping cost. Q. Why are narrow cabinets the same price as standard width cabinets? A. Although there is a saving in metal, all the production operations and components such as sliders are the same. It is the production efficiency we benefit through the higher volume in our standard cabinets that brings the cost of our standard cabinets down. The lower volume brings the cost of producing narrow cabinets up. A. In the unlikely event you are not completely satisfied with your Can-Am purchase, you may return the product in the original packaging in like-new condition (subject to inspection) for a full product refund within 10 days of purchase. Freight charges to and from your address will be at your expense. A. We accept Visa, MasterCard, American Express, Discover, and PayPal for payment. Certified cheques or money orders sent in advance of shipping are also accepted. We do not ship orders COD.